Time takes its toll on all of us. One minute you’re jumping around full of the joys of spring, the next your joints are beginning to creak and groan. Motorcycles are subject to the ravages of time too, like everything and everyone else. Bits get worn out, rust appears here and there and, of course, there are those little dents and scratches that mysteriously accumulate over the years. The difference with motorcycles is that you can take them to a place like White’s Bodyworks and return them pretty quickly to pristine condition. Whether it’s restoring an old, much loved motorcycle or rebuilding a classic to get it back on the road after years of neglect, you’ll need to draw on all the experience and skill you can to handle the job. If you are trying to decide whether you want to undertake a significant motorcycle restoration or not then here’s our take on the subject to help you make up your mind. Simply put, it’s a great hobby if you have the time and energy to do it. With programmes like Classic Car Rescue and more recently For The Love of Cars, interest in restoration has grown considerably, including motorcycle restoration. Restoring a classic is also a great investment. Classic motorcycles are highly sought after and, kept in pristine condition, their value is likely to increase over time. If you’re a beginner then you may want to start working on a list of what information and tools you need to put together and who can help you out. If you’ve already carried out a motorcycle restoration then you’ll know how addictive it can be. For most motorcycle enthusiasts there’s a time when they contemplate restoring a classic to its former glory. It’s something about the DNA of bikers – they like to tinker and they like to see those vintage bikes back on the road. Restoring a classic motorcycle though is more than just a case of a quick spray job and some new tyres. You’ll probably have to take that machine to bits to check the parts and clean them. You might have to source new and often rare parts to replace damaged or rusted ones. You have to put in a lot of time, love and attention into your motorcycle restoration. You may need to take it to a restoration specialist like White’s Bodyworks for those big jobs you can’t handle. There’s no doubt that restoring a classic motorcycle can be a major project that brings with it a great deal of satisfaction particularly when you finally take that baby out onto the road again. It may have been stuck in a garage for the last twenty years, gathering rust and dust, but you’ve brought it back to life. And that’s something to be proud of. With 20 years of experience, White’s Bodyworks have been carrying out restorations on classic bikes. Often an enthusiast will come to us when the project they are working on needs a little more expertise than they can bring to the table. 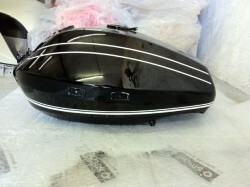 Take this 1937 Rudge petrol tank that needed to be shotblasted and painted. Or how about the complete respray on this 1970 BSA Bantam 175? It’s a good idea to have a digital camera handy. That may sound off the wall but if you are coaxing a vintage motorcycle back from the dead you want to keep a record of what it looked like and how it finished up and everything in between. It’s also a great tool for keeping track of where pieces fit when you strip it down. Secondly, you really need to do your research. The older a motorcycle is then the harder it will be to source the parts. And it’s probably a good idea to map how much you are going to need to spend. If you want some advice and support then White’s Bodyworks have a tonne of experience restoring those great old motorcycles. If you aren’t already, then maybe you should think about joining a motorcycle club. Like vintage cars, there are plenty of groups out there that can be a source of valuable advice and information. You may well be able to find a club in your area or you could find out where events are being held from a site such as The Vintage Motor Cycle Club. Another idea is to start something like a blog about your restoration that enthusiasts can read and interact with. If you want to see how one works, check out this blog documenting the restoration of a 1985 Suzuki GSXR 750. It’s not just the classics that need a little care and attention. Older motorcycles often need the attention of an experienced mechanic to get them back to pristine condition. Motorcyclists tend to have a closer affinity to their bikes compared to car drivers, and it’s often like losing a loved one when body and engine parts succumb to the ravages of time. There are several reasons why you should consider restoring your old motorcycle rather than buying a new one. First of all, it will add value back to your motorcycle. Maintaining the bodywork and engine in tip top condition means it will last longer, adding to not just the intrinsic value. Don’t forget: That motorcycle will one day be a classic too. 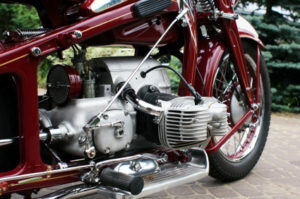 Restoration for a motorcycle can include can involve a number of things. The whole works might need restoring or just certain parts. You might have the gearbox and engine stripped down and rebuilt and the paintwork renewed. Undertaking such a big task as a restoration, as with classic motorcycles, involves a fair deal of time, energy and money. If you don’t have the expertise then you will be well advised to find a competent garage that can handle your make and model. And choosing the right garage can mean the difference between a pristine motorcycle and a botched job. Motorcycle restoration is a highly specialised skill. We know that at White’s Bodyworks because we’ve been doing it successfully for a number of years and we’ve got the satisfied customers to prove it. Here are our top tips for making sure you get the right garage to handle your baby. It’s often said that a good referral is worth its weight in motorbike oil. If you are part of a motorbike club then asking around can help you find a good body shop that can handle your much loved motorcycle. Bikers tend to be choosy when it comes to who touches their machine so the chances are a referral from a club will put you in touch with someone who is good at restorations. That doesn’t mean you should take every referral at face value. Check out their website if they have one and see what kind of work they are doing. If they have testimonials see what they say about different kinds of vehicles. The testimonials on the White’s Bodyworks site for instance cover a wide range of vehicles from new to old, car to motorcycle. If you have a big restoration in mind then ask for the contact details of similar jobs the garage has done in the past. They may well be the most gifted of mechanics but if they are working out of the backyard then think twice. A professional organisation will have a working garage that can handle all kinds of car and motorcycle repairs. Have a look around: Is the place organised? Do people look like they know what they are doing? How many vehicles are they servicing? Most motorcycle riders know what they are talking about when it comes to bikes so it should be easy to sift the good mechanics from the bad. If the owner is rushing you, then chances are they aren’t going to do a good job. Ask the right questions: How long have they been operating? How many people do they employ? What are their qualifications? How long will the job take? What needs to be done? If you’ve done your research beforehand then you will have a ball park figure in mind for what the motorcycle restoration is going to cost you. If the garage is charging well below that then alarm bells should start ringing as much as if the price is too high. A reputable garage will be up front and open about all the costs and will also have process in place to guarantee the work done. The RC45 is probably one of the most sought after bikes in the world because there were so few made. Mark Keneally from Crawley brought this one into White’s Bodyworks and it was apparent from the start that some major work was needed. 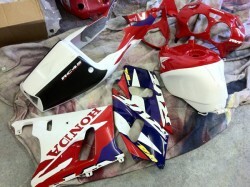 Find out more about the RC45 refurbishment here. If you are into classic motorcycle restoration then these five, two wheel behemoths will get your heart racing. It’s not just the idea of bringing something back from the rust heap that attracts many motorcycle restoration fanatics but the history associated with these models. Synonymous with the Isle of Man TT, this racing bike was considered the height of innovation at the time. It can still be built to order today, for a price, but every motorcycle restoration nut would sell their soul to get hold of an original. Getting on for a 90 years old, this Italian stallion was one of the most popular bikes throughout the 1930s and 40s. A fully restored Benelli 4 recently on sale had an asking price of £25,000. Highly desirable for any motorcycle restoration aficionado, there were only ever 1,700 made and the cost of a fully refurbished model is in the region of £30,000. Produced between 1931 and 1960, this is a quintessentially British kind of bike and can still be seen on the streets of India, though often in a seriously battered and worn state. As a racing bike the Bonneville got its name from setting the speed record on Bonneville Salt Lake Flats in America. It first went on sale to members of the public in 1959 and early models can fetch around £15,000 at auction. If you want to drool over some recent motorcycle restorations then a good source is the website for Classic British Motorcycles. There you will find details of a Rickman 250 brought back from the dead, a Triumph 3TA given a new lease of life, and the Bonneville Special restored to a pristine state. Any motorcycle restoration takes a fair degree of thought and consideration before you decide to take it on. Whether it’s a classic that needs a complete overhaul or a newer bike that has seen better days, White’s Bodyworks have the experience and passion to help get that beast back on the road. We can handle the total motorcycle restoration or just help you out with the bits that require a little extra expertise. Based in Hassocks in West Sussex, we’ve got a national reputation for working on classic cars and motorcycles, as well as more modern vehicles and we’re here to help in any way we can.